Home » Courses » main course » Oven Fried Chicken: Skimp on Calories, Not Taste! 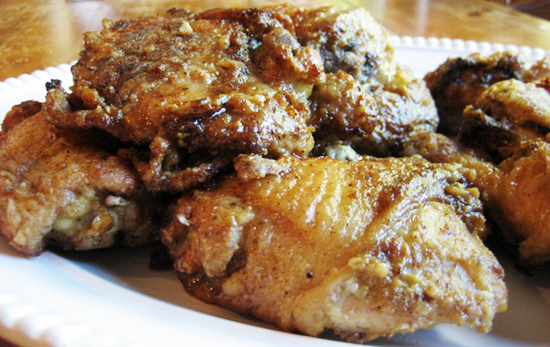 Oven Fried Chicken: Skimp on Calories, Not Taste! 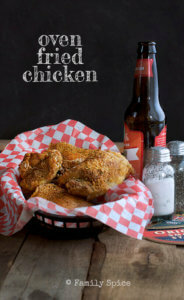 Have a hankering for fried chicken, but don’t want to fry? Then this oven fried chicken recipe is for you. The crispy chicken you love, but a lot healthier! I admit that I have a soft spot for most things fried. Who can resist the crispy, crunchy texture? Of course, the healthy-mom-and-wife in me is shouting, “NO WAY!” But, my husband still sneaks off to KFC with the co-workers to get his fix of fried chicken. What to do? 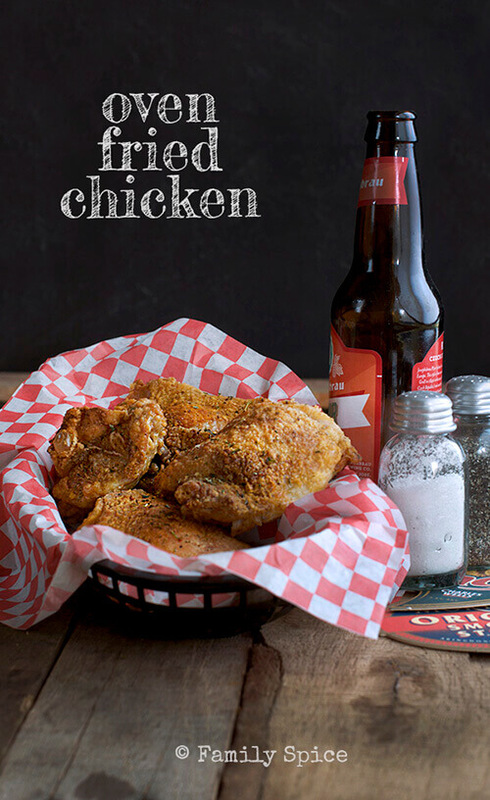 I found this recipe for Oven Fried Chicken years ago from an old Cooking Light magazine, and this has become a staple in my family’s menu for years. The kids love the taste, the husband loves the crunch and the taste, and I love that it’s easy to make and easy on the arteries. 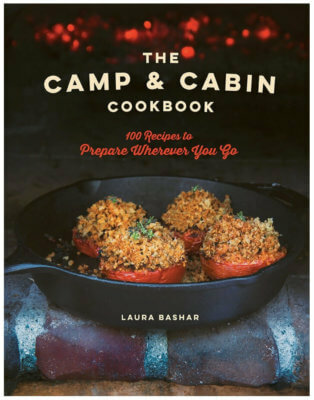 I introduced this recipe to my girls during my cooking camp last summer and they ate it all up. It really is ridiculously easy to throw together. The key is to use bone-in chicken legs and thighs. Do not use boneless chicken without adjusting the cooking times or you will end up with dried up meat. This makes great picnic and potluck food. I have taken a tray of oven friend chicken to boy scout events, NJROTC picnics, beach parties and the like. Everyone loves it. There’s nothing Earth-shattering with the recipe, just a touch of melted butter, some flour and an assortment of spices. You are basically roasting the chicken pieces of your choice (my personal favorite way to cook). There is minimal fuss and work in the kitchen. And, you get a lot of bang from your oven fried chicken. 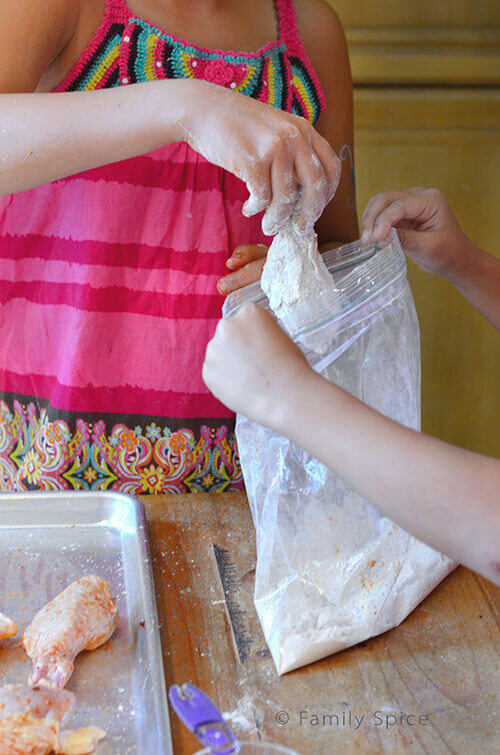 I love making a big batch of oven fried chicken and keeping it handy in the fridge for quick lunches or to pack up to go. I typically reheat it in the toaster so it gets back to being crunchified and crispy. 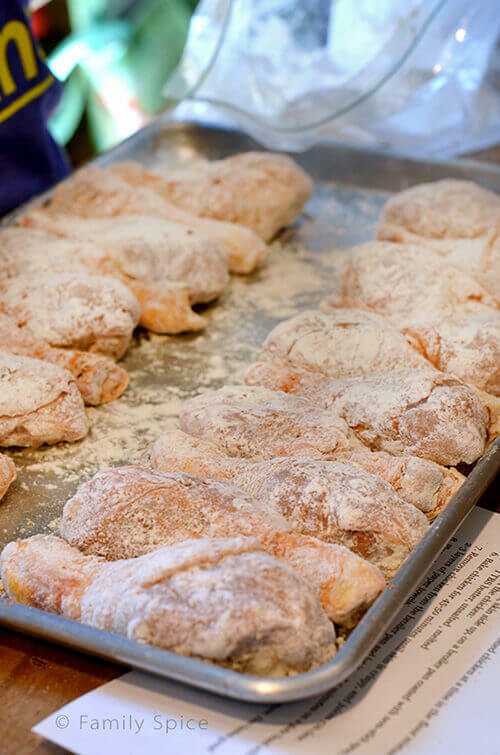 Place one piece of seasoned chicken at a time in the flour mixture and press to coat evenly. Bake chicken for 45-50 minutes until skin is crispy, and juices run clear. 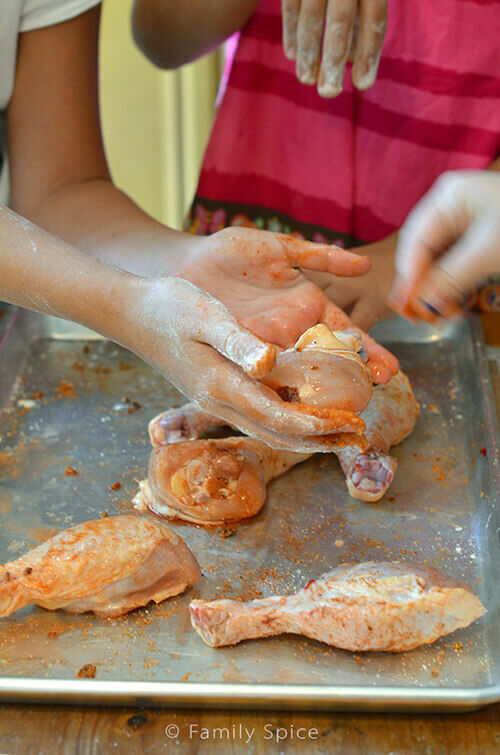 Remove chicken from the broiler pan and let it rest 5 minutes on a plate lined with 2-3 layers of paper towels. Place chicken on serving platter and serve hot or room temperature. Also tastes great cold, right from the refrigerator. Serving Suggestions: Great for the dinner table or on a picnic blanket. Oh yum! The ingredients look delicious. I love the idea of crispy without frying (and without the mess of all that oil). It’s just hard to imagine crispy in the oven. So many times I’ve seen recipes call for frying, then baking which still leaves the need for lots of oil (and lots of cleanup from splatter). I’m taking this recipe on the road. We have two family vacations this summer where I will be cooking. I can put the spices together at home and packaged them ready for the chicken when we arrive at our vacation destination. I’ll be the hero on the road in the kitchen not at home. Awesome!